Watching video is a strongly established way to consume information. YouTube has more than 1 billion unique visitors per month and recent studies show that 92% of adults ages 18-29, and 80% of adults ages 30-49 watch videos via internet. The main reason why videos are such a successful mean s of conveying information is that they are easy to consume, engaging and entertaining. However the common perception is that while learning from videos is fun and easy, creating eLearning videos is difficult and expensive. SlideTalk took as its own mission to change this perception, by making creation of eLearning videos a simple additional step to the much more common process of creating presentations. SlideTalk is a cloud service that converts presentations, PowerPoint presentation or any collection of slides, into videos with an automatic voiceover, using Acapela text to speech. 3 simple steps process to go on air! 1- user uploads a presentation and then types in an explanatory text for each slide. 3- Voiceover and slides are assembled into a video that is automatically published on YouTube or made available for download for publishing on intranets or corporate channels. “Many companies and organization regularly create presentations for both internal and external communication, but they seldom create videos, even if video is an enormously popular and efficient media to convey information.” Says Johan Isaksson, co-founder of SlideTalk. “With SlideTalk, if you know how to build a presentation, than you also know how to build a high-quality talking video. Publishing information via video also provide to audience with the additional benefit of being able to choose when and where to access the information, a property which is often referred to just-in-time learning”. ‘Speech synthesis is the perfect solution to easily give the say to content with expressive voices, in many languages and playing with different voice persona to animate the content. A solution such as Slide Talk provides a friendly and powerful way to produce efficient and valuable content to share.’ underlines Antoine Kauffeisen, Marketing Director of Acapela Group. SlideTalk provides a free access level and several premium options. “The text-to-speech from Acapela Group provides the excellence in quality and a rich amount of variations in the choice of voices to make the resulting videos trustworthy and engaging. The large voice portfolio is crucial for supporting storytelling, allowing usage of several voices and expressions in the same video. The international community can also benefit from the availability of 26 languages and more than 70 voices” adds Johan. 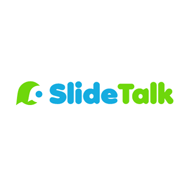 SlideTalk is a startup company founded in 2012. Its mission is to make creation of videos for eLearning, education, marketing and tutorials simple and accessible by anyone independently of the technical skills or expertise in the field of video productions. In the first months after its launch in early 2013, thousands of users have joined SlideTalk and have created thousands of SlideTalk videos for public publishing on YouTube or download. Acapela Group invents speech solutions to vocalize content with authentic & original voices that bring more meaning & intent. Over 100 resounding synthetic voices in 30 languages are ready to vocalize your content into a natural and pleasant audio result, by turning written input into speech. Acapela’s repertoire includes voices of characters or celebrities, voices with accents or specific dialect attributes, voices that sing or tell stories, voices that can adopt different moods, voices for all ages and all languages. Because one voice cannot answer all and any needs, we aim to provide a resounding repertoire. And we can create the voice you need. Just for you. This is Acapela bespoke expertise.